A healthy breakfast recipe for diabetes. The idlies are soft and fluffy. Soaking the ragi for longtime helps to grind the batter smoothly. The fermentation process is very important because if the batter was well fermented you can get a soft and fluffy idlies. 1. 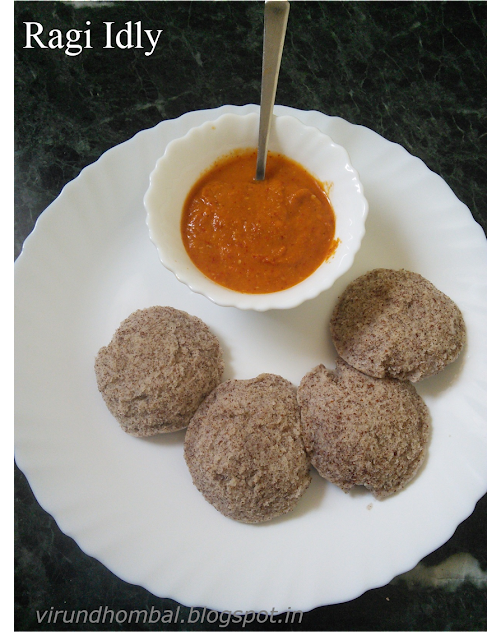 Take a big bowl and add the idly rice, ragi and raw rice. Add 6 to 9 cups of water and soak it for 8 to 10 hours.Soak urid dal and fenugreek in a separate bowl for 3 hours. 2. After 8 hours, rinse the rice and ragi for 5 to 6 times and drain the water completely. Rinse the urid dal for 3 times and drain the water completely. Add the rice and ragi to the wet grinder. Add 1 cup of water and grind it smoothly. It will take around 30 to 40 minutes. During grinding check the water and use your hands or spatula to wipe the rice and ragi which stick to the sides of the drum. 3. When the ragi rice batter was smooth, transfer it to the mixing bowl. Then add urid dal and grind it for some seconds. Then add 1/2 cup of water and grind. Allow it to grind for 20 to 25 seconds. Add required water during grinding the dal. When the batter is light and fluffy transfer the batter to the rice ragi mixture. Add 1/2 cup of water in the grinder and rinse it well. Add this water to the batter. 4. Now add the salt to the batter and mix well with your hands. Mix it well and until you see small bubbles are forming on the top of the batter. Close it with a lid and keep it in a warm place. Allow it to ferment for 10 to 12 hours. Grease the idli plate with little oil and pour the batter. Steam the idlies for 7 to 9 minutes. When the idlies are done, remove from the idly plate and serve it hot with onion chutney. You can also use this batter for crispy ragi dosas.You can also use ragi flour for this batter. Add ragi flour in the final stage while grinding or add it to the ground batter and mix it well without any lumps.